This dog is leading in the polls – don’t believe it, just ask him. 6. Make sure that your dog’s costume is the right fit. Don’t put him in a costume that is too small or tight. Also check for loose ends that could be chewed on and swallowed or cause other problems. If your dog hates having the costume on be a friend to him and take the costume off. It may seem like a lot, but the truth is that Halloween is a fun time for parents and kids and can easily be fun for dogs too. Many dogs enjoy being the center of attention and will tolerate wearing a costume (which we get a huge kick out of!) to do so. Keep an eye out for the dangers of candy, keep your dog secure in your house, and be ready to ward off over excited kids and all will be well. Happy Halloween. This was the year we were going to bake special Thanksgiving treats for Higgins the Totally Kids Shop Dog. Where does the time go? It is now Tuesday and the Thanksgiving countdown puts us on menu and food preparation planning for people. Another year passes and the special homemade dog treats for Higgins are back burnered once again. Christmas! We WILL cook up special Christmas dog treats for Higgins. Aren’t their turkey legs and pumpkin pie slices for pooches the cutest. Even if we had eecked out some time for our project, the results would never have been eye candy like those. Mary, at Home is Where the Boat Is, wins the prize for her turkey treats wouldn’t you say? Her two furry friends, Chloe and Gracie are always treated royally and not forgotten at Thanksgiving. 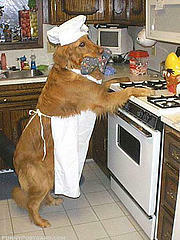 She has the recipe and pictorial for cooking up those pet pleasing turkey treats. Hop on over to her blog where you fill find loads of decorating inspiration as well as many how-tos for pups. You’ll be thankful that you did. Have a Doggone Happy Thanksgiving! All you canines out there, tomorrow, June 21, is Take Your Dog to Work Day. No dogs on this sofa, so jump up and enjoy a day at work with your people. About 1.4 million owners take some 2.3 million dogs to work every day, according to an American Pet Products Association survey. Perks of a shop dog! Higgins, the shop dog, at Totally Kids fun furniture and toys works everyday. Well, goes to work, but it’s debatable whether or not she works. If lounging and thinking that she looks cute sitting a chair or under a desk is work, well then. Try introducing these steps for a calm and successful day at the office. 1. If possible, send out a simple “dog rules” memo to all your co-workers. The memo should address protocol for the day. Outline where dogs are allowed and where they are not, specify what to do in the case of a mess and rules for approaching a dog that’s new to the office, starting with “no touch, no talk, no eye contact.” Require all dogs to be spayed or neutered and up-to-date on all shots. Clearly define “off limits” areas of the office and be aware of colleagues that may be allergic to dogs. 2. Make sure you exercise your dog before you bring him or her to the office. You want to exhaust some of that pent-up morning energy before arriving at work. 3. Once you arrive, make a safe, cozy resting spot near you. 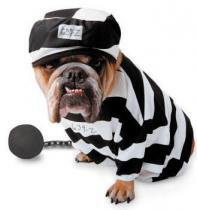 This will keep your dog from acting territorial, and reduce separation anxiety. 4. Lead your dog around the office at the beginning of the day and let him smell his surroundings. This way you can introduce him in neutral territory. 5. If your dog’s stay is short, provide water but no food or treats. If your dog is staying for the entire day, you’ll have to provide food but make sure you exercise him before feeding. Nick-Nack-Paddy-Wack Give Your Dog a Bone recipe below. This recipe and many other dog treats can be found at the Pet Guide. 2. Mix together the flour and baking powder in a big bowl. 3. In a separate bowl, mix together the peanut butter and hot water until smooth. Slowly add the dry mixture and mix well. Add a little more water or milk if the dough is too dry, or flour if it’s too wet. 4. Place onto your counter and roll to 1/4″ thickness. 5. Cut with a bone shaped cookie cutter and place on a cookie sheet. 6. Bake for 20 minutes or until lightly brown. Let cool, and then let the begging begin! “No Dogs on This Sofa” pillow is available at: CallyCo. 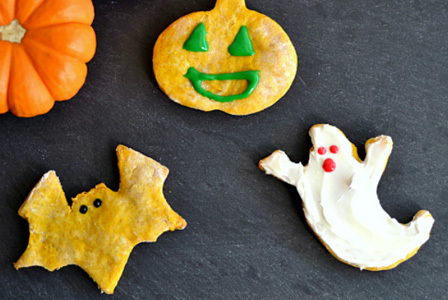 Halloween treats to make your pooch howl! Pop over to She Knows cause she really does know how to make these Pumpkin & Peanut Butter Dog Treats and will show you how to too.